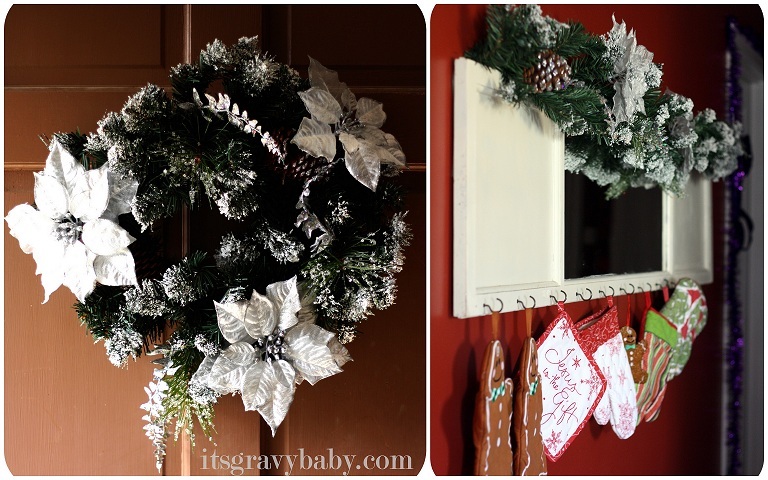 Holiday Decorating on a Budget with Kmart - It's Gravy, Baby! Our family tradition is to begin decorating the day after Thanksgiving. That was also the plan for this year until I was chosen as a Kmart Holiday Blogger. I’m so excited to take part in this campaign even if it forced me to decorate earlier than usual. As a Kmart Holiday Blogger, I was given $150 and a challenge- take that money and see how far I could stretch it on holiday decor at Kmart. Y’all know that I love making our home beautiful and decorating seasonally is an easy way to switch things up during the year. When it comes to holiday decor, I love color. I know some people can stick to just green and red, but I simply can’t do that. I want red and green for sure, but I want pink, blue, and purple too! I love to bring touches of holiday cheer to every room in our home and as soon as I saw the bow selection at Kmart, I knew just how to achieve that. There were bows in every color, every style, with characters, glittered- you name it, they had it! 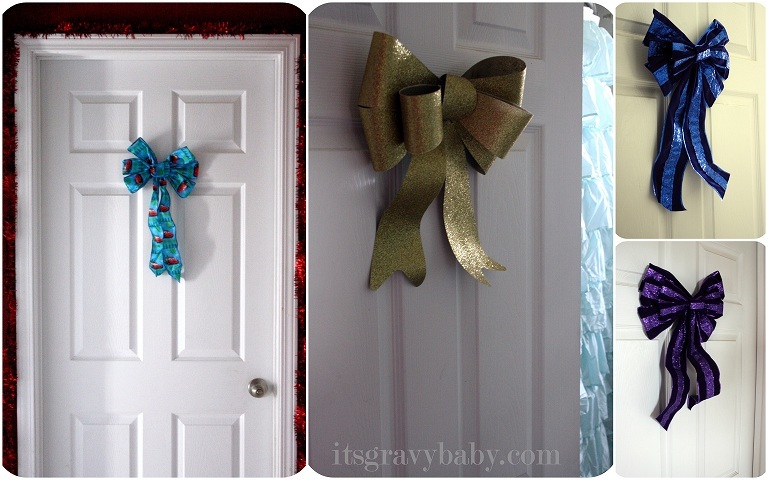 Bows now adorn each bedroom and our bathroom. I added tinsel garland around the doors on Bryson and Bella’s room to give them a special touch. Going into this challenge I had no intentions of decorating the bathroom, but after seeing the selection at Kmart, our entire bath got a holiday cheer makeover. It was so, so hard to choose a theme because everything was adorable. After showing Justin my options, I told him to make the final decision because I wanted it all. 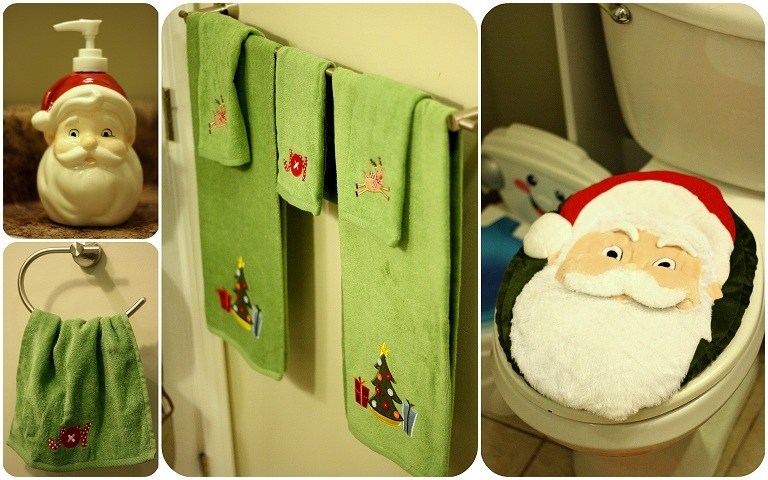 He settled on Santa and I love how it all came together in our bathroom. I wasn’t sure about how I’d feel with Santa staring up from the potty, but he’s pretty cute and Bryson thinks it’s the coolest thing ever. Our purchases for the bathroom were two holiday towel sets, a Santa lotion dispenser, and a Santa toilet seat cover. Our kitchen and our living room are the rooms we spend the most time in. I love to add special touches to those rooms, so everyone that walks in can feel the love of our family. Two of my favorite finds from my shop at Kmart are from the Jaclyn Smith Midnight Clear Collection. The 22″ Poinsetta Wreath and matching garland are simply gorgeous. Bringing in new linens, dish cloths, pot holders, etc. 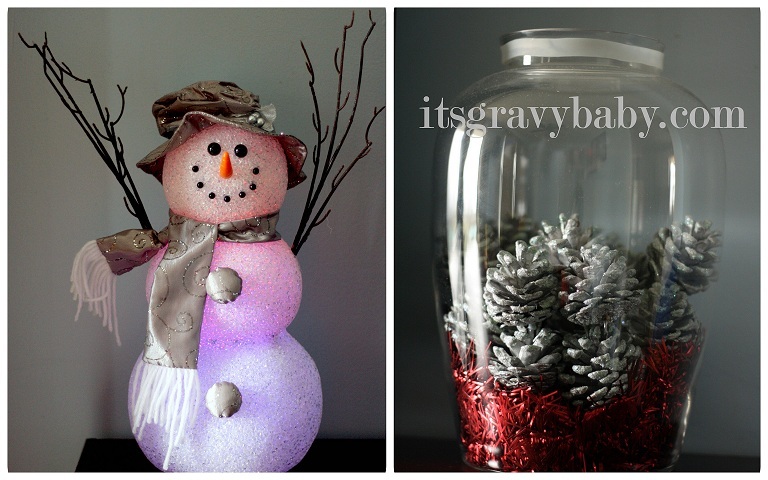 are easy and affordable ways to add splashes of cheer to your decor. I love finding cute new items to display and use in the kitchen. I’m a sucker for pot holders especially and I have different ones for each holiday. Bryson’s favorite holiday piece is Mr. Snowman. He changes colors and Bryson wants him on 24/7. I added some red tinsel and glittered pine cone ornaments to a vase for some simple decor in our living room. All total, I spent right around $170. After sales, my receipt showed that I saved over $75! I was able to decorate every room in our home with items purchased, so I am more than pleased with the prices and my purchases. The only thing I didn’t find was an advent calendar. I really want one this year, so I’m still on the look out. To view my entire shopping trip and see more photos, please check out my Holiday Decorating album! So cute!! I love it all! I’m going tomorrow to get my holiday decor at Kmart! I can’t wait! Good job, Whit! Very good ideas. Love all the decorations, especially the bows! I’m going to have to get some for our house. The vase with pinecones is my favorite – so classy! Wow! You were really able to get a lot of stuff! And you’ve inspired me to decorate our bathroom this year! Love it girl! It all looks great. I think my favorite is the bathroom stuff…funny i know but I love to decorate the bathroom! Everything looks so pretty! The pinecones in the vases are such a nice touch! I like to put fake holly in bowls on my coffee tables…now I want to add pinecones! 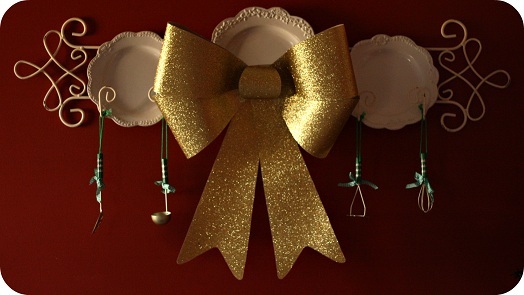 OMG; LOVE the big glittery bow and spray painted pinecones. It all looks FABULOUS!!! I REALLY love the plate hanging decor and the board with oven mittens!! I miss having a KMART around the corner!! :-/ They also had such good sales and cute stuff!! Looks great! I just decorated my fireplace and mantel with the help of some Kmart decorations! That looks great! I love the decorations. The pot holder display is so creative!!! Very nice! I also love the potholder display as the person above mentioned! I hope to have a mini tree in each of the bedrooms this year too. We will see if that goal comes together or not. I love all of these! So pretty and classy (well, the toilet seat cover gets a “classy” exception, but I still like it)! You did a great job! I wouldn’t have even known you were on a budget if you hadn’t shared. Everything looks so pretty and Christmasy! Oh my gosh, I LOVE what you did to the bathroom. I always keep my decorating to the living room but that’s such a cute idea, too cute to NOT do. This is a good reminder for me. As I was putting up our decorations this year I noticed how so many are tired and falling apart after 19 years of use and the wear and tear of 4 kids. I was beginning to despair about how many needed to be replaced. I always seemed to purchase the cheaper decorations that inevitably do not stand the test of time. At the same time, I purchase them after the holidays when my focus is on saving money and not spending too much! You have reminded me of the beauty in simplicity and that the large, and sometimes garish, decorations I feel I should replace might not need to be replaced after all.